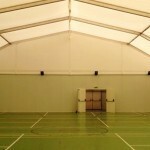 Temporary Sports Halls - Bees Marquee Hire - Wedding, Parties and Corporate Events. 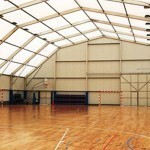 Bees marquees offer unparalleled expertise when it comes to the design and build of temporary sports buildings, school sports halls, gymnasiums, equestrian centres, and tennis courts. We can add heating and air-conditioning, along with many other optional extras, offering attractive and functional leisure or sports facilities that can be used year-round. We offer a free consultation when you contact us, and conduct a detailed site requirements analysis before embarking on the best solution for your temporary structure. Brief: a school sports hall – built nearly 50 years ago – began to deteriorate to point where it was no longer deemed safe for use. 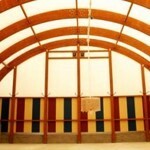 Plans had been made for a new building, but planning permission was still being considered, so Bees were commissioned to provide a temporary sports hall, to last up to two years. 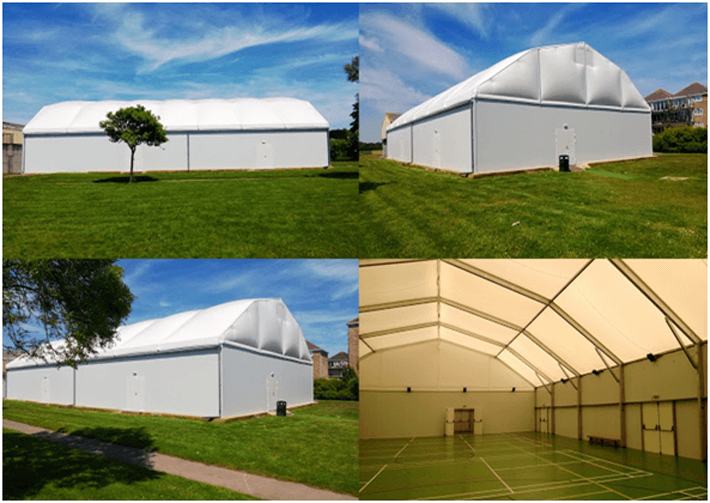 Solution: A 20m x 35m polygon roof structure with; Thermo inflated PVC roof, insulated walls, timber floor with non-slip vinyl surface, internal partition, changing rooms, lighting and heating, power points.